Running has been going well. Extremely well. I almost hate to admit that because it probably means I will injure myself at any moment. But hopefully not. I've been focusing a lot on my form as I try to transition to a forefoot strike pattern (rather than a heel-strike pattern). It's hard to try to correct 18 years of bad form. Really hard. But I'm making progress. I ran farther in April 2012 than I did in any other month in the last 10 years, and I haven't had a hint of knee pain. Of course, some of that has come at the expense of really sore calves on account of using different muscles that are much less well developed. I'll take sore calves for a few hours over semi-permanent knee pain 10 times out of 10. I found a great place to run barefoot: the glorious artificial turf on the WUSTL track infield (some people might call it a football field). Of the 146 miles I ran in April, 19 of them were completely barefoot, and some of those were pretty fast (5:32). The majority of the remaining miles were in my wonderful new Luna Sandals (yes, sandals), with the rest in my Vibram FiveFinger Bikilas, Merrell Trail Gloves, and New Balance MT 110s. I guess I have something of a shoe fetish (yet I still run barefoot). I just pick the thinnest shoes I can get away with based on the route I have in mind, and take them off whenever I can. I've been a regular at the Tuesday night crits, though I did miss a couple. I've been lucky to get two training rides a week. Considering where I started at the beginning of this year I've already come a long way, but I still have a long way to go. Looking at my race results over the past year or so it's pretty clear where my talent lies. Cycling: 15, 4, 45, 47, 40, 17. Running: 2, 9, 16, 4, 2, 4, 10, 1. Single digit placings are better than double digit placings. If I want to achieve more success in cycling races I'm going to have to spend more time (which I don't have) practicing. Or maybe blood doping. Yes, the numbers are small. I just started late in the month. What's promising, though, is just how quickly I was able to pick this back up after months off (and if you don't count that week in September, years off). Last Sunday was the Eads Bridge Duathlon. It starts and finishes on Eads Bridge (the oldest bridge across the Mississippi River) downtown, with a 1.5 mile run, followed by a 10 mile bike, and finishing with another 1.5 mile run. I haven't ridden my time trial/triathlon bike since September, but I've been running well… so it should all even out. Right? The race itself was very well organized, which almost makes up for the dearth of useful information on the event website. Answers to simple questions would have gone a long way. How do I get to the event with all the road closures? Where do I park my car and do I have to pay for parking? Is the event sanctioned by USA Triathlon (and therefore require an up-to-date USAT license)? During my warmup I tried on my friend Mark's aero helmet, which he was looking to sell. It worked well enough, so I decided to go with it during the race. I noticed my warmup on the bike was not as fast as it felt. I guess I'm more out of practice than I thought. I ran a short warmup, then headed up the hill from the river onto the bridge, where the start/finish line was. It was cool, 48˚F. Moments before the start I began to feel raindrops. The announcer sent us off and I wasted no time rubbing shoulders with the leaders. The run was so short I knew it would be quite fast. We ran across the bridge, down to ground level on the Illinois side, then back up across the bridge in the other direction, down to ground level on the Missouri side for the first transition. About halfway through the run I ceded a little ground to two other guys. The run turned out to be a little long, 1.73 miles according to my GPS, and I averaged 5:23 pace. I came into the transition area a little more hypoxic than I'm used to in a triathlon after swimming. I had a bad transition, trying to changes shoes while balancing on one foot and light-headed. The fourth runner passed me in the transition area, but I passed him right back as soon as we got on our bikes. I took the start slow, with the uphill, the railroad tracks, the rough corners. Finally we hit the long straightaway. Now a different rider blew past me. I picked up my game a bit and hung with him for a few miles. At the first turnaround I could see the two leaders had a sizable, but not insurmountable gap. At the end of the first lap I lost my concentration a bit and dropped back from the third guy. As soon as we started on the second loop we were mixing it in with lapped competitors just starting the bike leg, at which point I completely lost sight of the guy. With each turn I could see the three people ahead me getting farther and farther ahead. I tried not to look down at my GPS to see my speed, because it wasn't very reassuring. I wasn't having a good ride. At this point it was pouring down rain and my shoes and socks were completely soaked. The advertised 10 mile course was short, only 9.4 miles, which means my average speed was only 21.5 mph. Even factoring in the awful weather, that's weak, even by my standards. My second transition was a bit better, but still not great. I started out well enough on the second run. Then I immediately hit the large hill, and I slowed way down. Up on the bridge I could see the person in front of me off in the distance. The gaps were huge at this point, minutes in both directions. Cold, wet, tired, I found it difficult to push the pace and I just cruised into the finish line, averaging 6:18 pace for the second 1.73 mile run. I finished fourth place. Melissa and Will were waiting at the finish line. In the rain. They were nice enough to come out to cheer me on. We didn't waste much time on the bridge before we headed down to my car to dry off and warm up. The race went reasonably well, even if I was rather disappointed in my bike leg. One problem I've had living in St. Louis is that there are so many bike races, yet I hardly ever find out about them until after they're over. Friends would keep telling me to check the calendar at STL Biking, but I'd always forget. I finally got around to checking it a few weeks ago and I came across a very interesting race, Tracks N Treads off-road "biathlon" (run/bike, not ski/shoot). So, an off-road triathlon without the swimming. I've been wanting to do an off-road triathlon for years, so this semi-local event seemed as good a time as any to start. The problem with this idea is that, while I've run more trail races than I can count, I've never raced on a mountain bike before. And the thought of doing so kind of scared the hell out of me. So this was a bigger leap for me than it may seem. 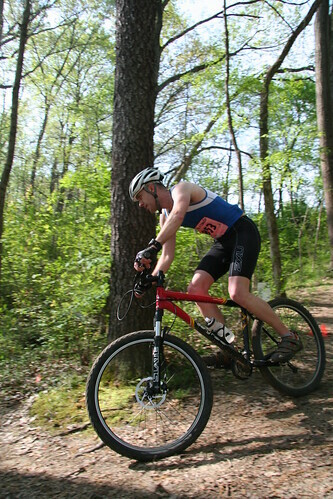 The most helpful thing was that I drove over to Edwardsville to ride the trails at SIUE last weekend. I can't imagine racing those trails without the experience I gained from just that one ride. Although I didn't know every turn like the back of my hand, I did remember the big picture, and I knew exactly what to expect. The forecast was supposed to be warm, and it was over 60˚F when I left my house, but it was only 50˚F in Edwardsville when I arrived. I brought several possible shirts to race in, but they were all sleeveless. Whoops. Well, if that's the worst thing that happens then I'm in for a good day. The bike started with about .75 miles on a paved path before entering the woods. I made sure to drink as much as I could and take some gel before the woods, because I knew I wouldn't have a free hand once we hit the single-track. One guy caught up with me just before the turn into the woods, but he didn't pass me. I went hard once we hit the dirt and after a few turns I put some distance between us. There were a few times during the early miles I could hear a rider approaching, but nobody caught up. Until about half way through. A guy came up fast and, after tailing me for a while, he found a spot to pass and he overtook me. I raised my game a bit and I tried to stay with him, but he was just better than me. I couldn't take the turns as fast as he did and he pulled away. So much for first place. A short while later another guy quickly caught and passed me. This dude was on a cyclocross bike. During the 30 seconds or so I was able to follow him it was obvious he was out of my league. I don't feel a bit bad about losing to someone like that. I started to worry that maybe there was a whole line of people poised to rip past me, but that never came to fruition. A third guy caught up with me just before we dropped back out onto the pavement. I went out first and hammered the last .75 miles at 23 mph and he wasn't able to get around me. I finished 3rd. I later discovered one of the guys who passed me was on a relay team, so I was the 2nd place individual. The race really couldn't have gone any better for me. The hard run effort didn't slow me down at all on the bike section. I'm used to running after biking (as is customary in triathlons), so I wasn't quite sure how fast I could get away with running. The bike leg pushed me to my technical limits, but I was fortunately pretty far from my physical limits. As scary as it was the first time, I could possibly get used to racing on a mountain bike. I just need to practice. A lot. "Won't somebody please think of the children?!" 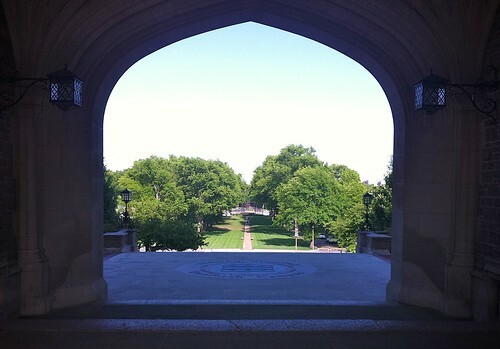 A couple months ago a WUSTL student approached me in the locker room (seeing that I was wearing running clothes) about the Take Steps for Kids 5K race put on by a student group. He seemed like he couldn't quite tell if I was up to it. I didn't have the heart to tell him I was training for a 50K at the time. But I took the information and marked it on my calendar. I do enjoy a good 5K race. Last Saturday was the day. I ran to campus to register, then ran back home to drop off my goodie bag, then ran back to the race, then ran around campus. I used to get away with a 1 mile warmup for a 5K, but in my old age I really run the fastest in miles 3-6, so now I try to do a 3 mile warmup. The course was two loops around campus, including the awesome, fast downhill section of the sidewalk along Forsyth. On the day of the race there was also a tailwind here. 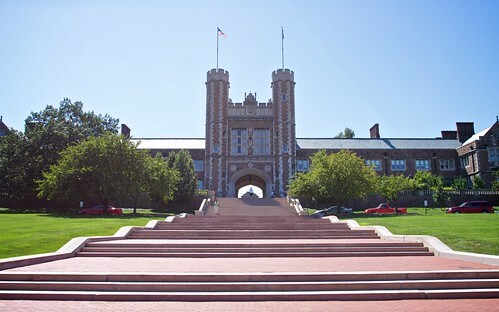 On the flip side we had to run up all those stairs in front of Brookings hall. I wasn't looking forward to it, but, meh, how hard could it be? The race started fast, as most 5Ks do. I tried to hang out behind a pack of runners as we started into the headwind. One guy was pulling away as we reached the fast downhill section, so I gave chase. The first mile was 5:26. I couldn't quite close the gap before we reached the bottom of the hill, turned around, and ran up the stairs into the headwind. I was spent by the time I reached the top. The second mile was considerably slower, 5:50-something. By the time we reached the fast downhill section again we ran into the back of the pack who were still on their first lap, and I had to weave back and forth to dodge some of the people who couldn't be bothered to step aside. I pushed again on the downhill section, but I couldn't make up any more ground. 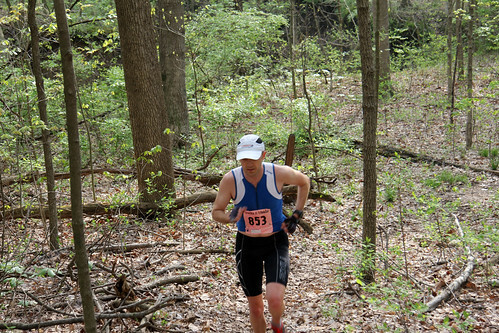 I came through the finish in 2nd place overall at 17:26. Technically, this is a new 5K PR for me, though it feels a bit dirty. The course did have a net loss in elevation (we didn't have to run back up the stairs on the second lap). Even so, I wasn't expecting to run that fast. I've done very little speed work since Fuego y Agua (and even less before that). After the race I ran another 7 miles easy.